The Architect designed Outrigger has a wonderful loft/open plan living area with expansive windows looking onto a large, private balcony from which you can enjoy the sunset over the Indian Ocean. Polished timber floors, sunny vista and modern, stylish furniture enhance the relaxed holiday atmosphere of The Outrigger. Two bedrooms on the lower level have glass sliding door access to the fabulous deck, and combined with the loft, the property sleeps 6 people (Two queen beds and two single beds). Ensuite & 2nd bathroom. TV, DVD Home Theatre, Stereo/CD, Dishwasher, Microwave & Oven, Gas BBQ & washing machine. Linen and bath towels included. Bathroom 1 (ensuite): shower, toilet, heat lamp. Bathroom 2: shower over bath, toilet. The Outrigger is situated in the new beachfront location of Gnarabup, the most sought after accomodation region in the Margaret River Area. Only 250m from Gnarabup Beach and 1 km from famous Surfers Point. Ocean views on an elevated block. 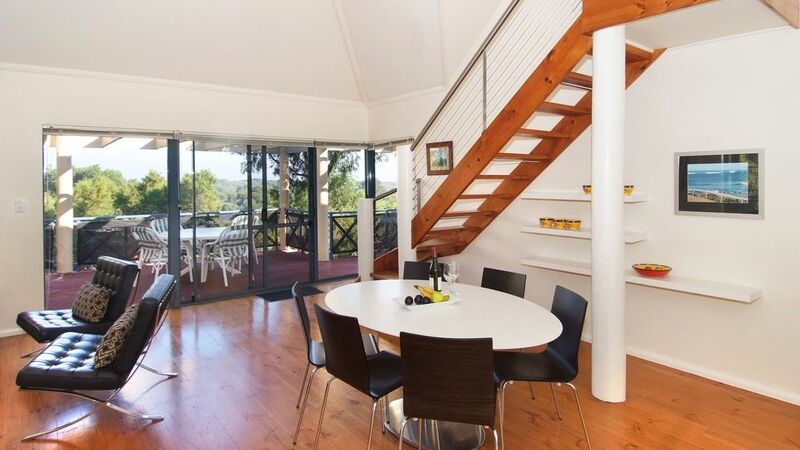 Leisurely 10 min drive to Margaret River town. Endless surf breaks. Famous Surfers Point. Have just returned home today. we had a wonderful time at outrigger. the weather turned it on for us and we returned home to the east to 30 degree temps. we have been recommending outrigger to friends and family as was great for a family and balcony and yard safe for littlies. Hi Simon, just wanted to drop you a quick email to say thankyou. We absolutely loved our short break and were really happy with both the accomodation and the attention to detail (such as the platters, glassware, bedding etc). It was just truly wonderful and you will no doubt see us back in the near future. Instant coffee, tea, sugar, salt & pepper supplied. Full Kitchen - recently renovated with new oven, cooktop and fridge. The Outrigger was clean and comfortable, with plenty of space for the family, on a lovely quiet street, located just a short walk away from a great little takeaway coffee spot or the white elephant cafe over looking the beach. Highly recommend. Hi Dan, I'm so glad you enjoyed the great atmosphere at The Outrigger. Hope to have you stay again in the future. We have it on our list " best houses"
Thanks for the great review Rene. This property was the perfect location for my holiday. Close to the beach, beautiful location to see sunrises and sunsets and listen to the crashing waves at night. A short drive in to town if needed. The house has a great holiday feel to it and has everything you need. Thanks for the great review Andrea! Very good to stay with family. The kids loved the attic bedroom with view of the Indian Ocean. The best part is how close Outrigger is close to the Indian Ocean. Would suggest to any families wanting a good & peaceful stay with all amenities in a house as against a motel.